Earlier this month, a luxury cruise ship carrying more than 1,000 passengers and 600 crew set sail to transit the Northwest Passage from Alaska. Although this is not the first time a cruise ship has completed the much-vaunted route, never before has a luxury ship of this size done so, and that has raised concerns both for safety and for the environment. When Sir John Franklin set off in 1845 aboard HMS Erebus and HMS Terror to complete the first successful transit of the Northwest Passage, his long list of provisions included fine wines and port, great hams and wheels of cheese, along with a vast library and other comforts from home. When the Crystal Serenity departed from Seward, Alaska on August 16, 2016, bound for New York City, the ship had all that Franklin enjoyed plus swimming pools, spas, a casino, tennis courts, fine restaurants and designer boutiques. Plus, while Franklin and his men toiled with the harsh environment every time they ventured on deck or ashore, the Serenity’s passengers can head out by helicopter, engage in a bit of Arctic golfing near Ulukhaktok, Northwest Territories, or just stay in their cabins and enjoy their own butler service. Of course, we all know what befell Franklin and his men—but if the Crystal Serenity has a major problem while in Arctic waters, the situation could be almost as dire. It has been a number of decades since passenger-carrying vessels (often called expedition ships) began operating in Arctic and Antarctic waters. The ships, often relatively small, custom-built for extreme conditions, having the latest in specialized navigational equipment and piloted by some of the most ice-experienced captains on the planet, regularly ply their trade around the Antarctic Peninsula, down to the Ross Sea, around the Falklands and South Georgia, or north to Baffin Island, Greenland and beyond. Yet for all of their precautions, and the expertise of their owners and crews, accidents do happen. In November 2007, the Canadian-owned expedition ship MS Explorer had a hole ripped in its hull one night while sailing through heavy ice 25 miles southeast of King George Island, approximately 1,000 kilometres south of Ushuaia, Argentina. The Explorer, a legendary custom-built Antarctic expedition ship launched in 1969—and the first cruise ship ever to navigate the Northwest Passage—quickly took on water, as the 91 passengers and 63 guides and crew took to lifeboats and Zodiacs. What could have been a terrible catastrophe was averted, thanks to unusually calm seas that night and, despite the extreme remoteness of the incident, the fortuitously close proximity of a number of other vessels. Approximately five hours after the Explorer issued its mayday call, the Norwegian Coastal Express ship MS Nordnorge arrived on scene and safely rescued all passengers and crew, before transferring them to the Chilean Frei Montalva Antarctic Station. While no lives were lost on the Explorer, should a mammoth ocean liner carrying 1,600 or more people suffer a similar accident in the Arctic or Antarctic, the outcome could be considerably worse. 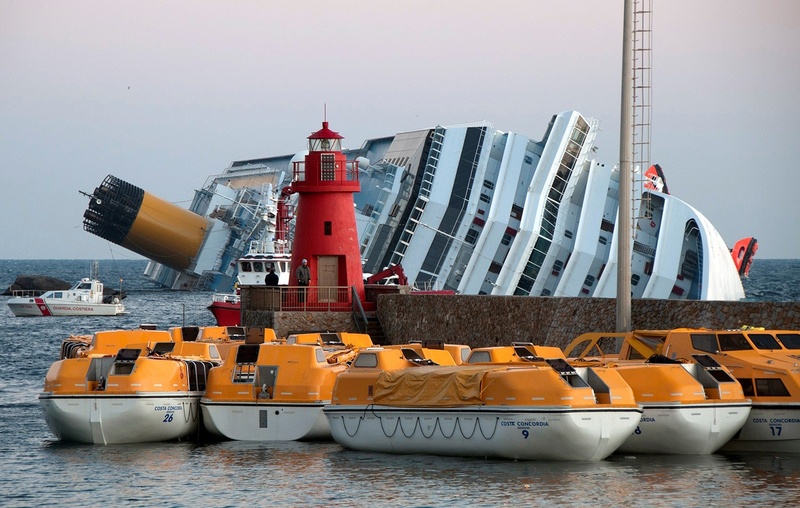 And who can forget the fate of the massive cruise ship the Costa Concordia, which sank in 2012 after hitting rocks literally within metres of a shoreline in the Mediterrean, and that took the lives of 32 people? That incident occurred in shallow, warm water and within reach of a rescue. Not only are cruise ships generally not as sufficiently ice-strengthened or as maneuverable as smaller, specialized expedition ships like the Explorer, but by the very nature of the product being sold (a luxury experience), some passengers are often less mobile than people who choose more active and adventurous voyages, thereby making evacuation and survival in adverse conditions potentially more difficult. Crystal Cruises have done everything possible to prepare for this history-making voyage. For its trip, the Crystal Serenity will be escorted by the British Antarctic Survey research ship the RRS Shackleton, while both Canadian and U.S. authorities have worked closely with the cruise line to have drills and procedures in place should anything go wrong. Still, even with such preparation and coordination in place, safely evacuating more than 1,600 people from a cruise ship in the Arctic would be a tremendous challenge, and that’s without considering possible environmental ramifications. After the sinking of the Liberian-flagged MS Explorer, the accident report issued by Liberia’s Bureau of Maritime Affairs stated that a five-kilometre-square sheen of oil was sighted by the Chilean Navy near the site of the sinking. Although that might only amount to a few cubic metres of oil having leaked, in a pristine environment such as the Antarctic or Arctic, even a relatively small leak, can have devastating results. With the Explorer being less than a third the length of the Serenity, the impact that a full-size cruise ship would have on the environment could be absolutely catastrophic. Not long before the MS Explorer went down, I was fortunate to fulfill a lifelong dream of visiting the Antarctic on that very ship. To say it was the experience of a lifetime would be a vast understatement. While I would hate to deprive anyone of having a similar experience—especially those who may not have the health or mobility to participate in a small-ship or expedition cruise—I do believe the concerns for the environment and for the ability to swiftly and capably rescue thousands of passengers and crewmembers, should an accident occur on any large cruise ship, are valid. Crystal Cruises have gone to great lengths to ensure the safety of their passengers and crew, and I am hopeful their epic Northwest Passage voyage will go flawlessly. But I remain unconvinced that extreme waters are the place for 68,000-tonne luxury cruise line ships.